A lot of athletes have their own pre-game ritual, and it’s often as individual and unique as the athlete themselves. That’s all good and fine! Marner offered an explanation of his fine dining sensibilities, but we aren’t having any of it, and Tyler Ennis couldn’t resist a smile while chatting about it. 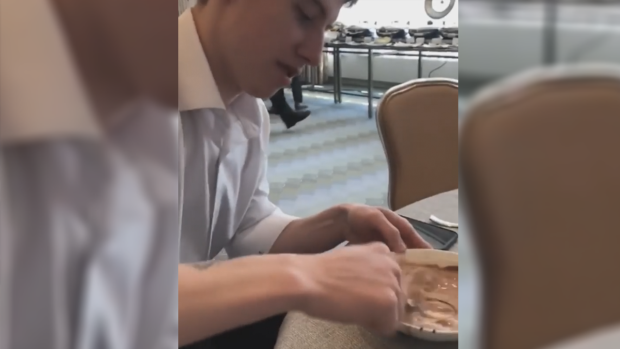 After a video was posted on social media by the NHL showing Mitch Marner digging into a bowl of "ice cream soup" before Game 1, many fans believe it's what helped him shine in the series opener. Tyler Ennis jokes about his teammates unique routine, while Marner sheds light on the origins of his tasty pre-game treat. You know, one way to look at this is to say that if it works, it works, and it sure seems to be working so far for Marner after he potted two goals in the Leafs’ Game 1 win against the Bruins. But you have to draw a line somewhere! Ice cream soup? That’s weird, right? If you’re fresh out of kindergarten or something, then sure, go nuts, but the rest of us don’t have that excuse. Although, with playoff peach fuzz like that, maybe the kid in Marner gets to claim ice cream soup after all.